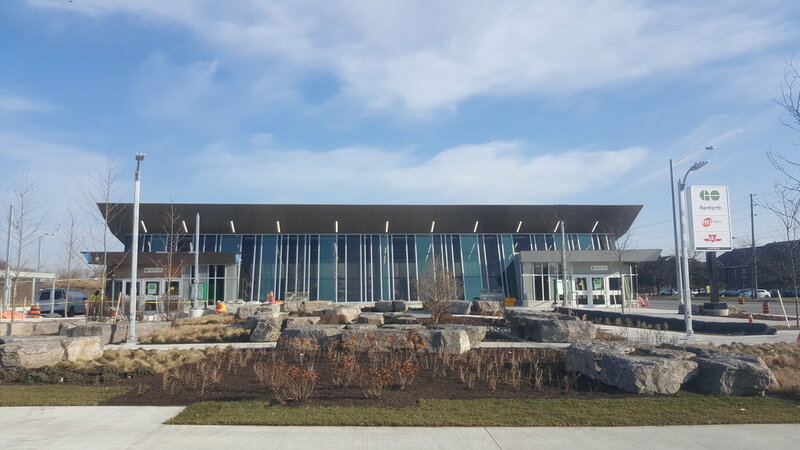 Renforth station is officially open, and with that the Mississauga Transitway is complete! Let us guide you route-by-route, to learn everything you need to ride MiWay on the transitway. Several MiWay routes travel along this 18-kilometer, 12-station, bus-only corridor, to help make your commute quick and hassle-free. Commuters are expected to save 15 minutes riding MiWay on the transitway, and 10 minutes compared to driving, when travelling from Winston Churchill to Renforth station. During peak hours, buses arrive every 5 minutes to keep you moving, and while you wait you can enjoy Wi-Fi and heated enclosures at every station. MiLocal route 21 Explorer travels along the transitway between City Centre Transit Terminal and Dixie station, then travels within the Airport Corporate Centre and services Renforth station. MiLocal route 87 Meadowvale-Skymark travels between Tahoe station and the new Renforth station. MiExpress route 107 Malton Express travels between City Centre Transit Terminal and the new Renforth station before heading north to service Westwood Square and Humber College. MiExpress route 109 Meadowvale Express travels the full length of the transitway, from Winston Churchill station in the west to Renforth station in the east before heading south to the Islington subway station . To plan your trip along the transitway, use MiWay’s online trip planner. If you are travelling to and from Mississauga on transit, use Triplinx to plan your multi-system trip. Get to the airport from Renforth Station. Catch either the 7 Airport North or 107 Malton Express from Renforth station at platform 7. Connect with GO bus routes 19 and 40 now at Renforth Station – Platform 4 Westbound, Platform 5 Eastbound. Visit gotransit.com for routes and schedules. Reaching Toronto is even easier from the new Renforth station. For the Bloor-Danforth subway line: take the 112 West Mall southbound to Kipling station. For the Yonge-University subway line: take the 32 Eglinton West eastbound to Eglinton West station. Brampton Transit bus service is available at City Centre Transit Terminal and Dixie station. Visit bramptontransit.ca for routes and schedules. What’s stopping you? Find out more about the benefits of the Mississauga Transitway today!